When we moved from our townhouse to this one we trashed our old bookcases. (mostly because they were pretty rickety and very ugly) Ridding ourselves of the shelves left us in a little predicament and because I don't believe in trashing books (Donating, yes...Dumping, no) we had no where to put our hundreds of books. We have a an empty corner right in front of you when you walk in the door of our house so I thought something like this would be perfect. First I started by begging my husband to build the shelves. Luckily, he likes doing things like this so it wasn't too hard. I guess I could have done it but my nails...jk. I did however tape it off for him. I know, I know it's hard work but someone had to do it. On a side note: we (and by that I mean the talented man in the house) have to still install the wood underneath each shelf to hide the screws and such. Also, with decorations, they only hold about a quarter of the books we have. oops. Fourth constitutes blue prints, no? Where did you buy the shelves? Or did your husband make them? can you tell me if you made the shelves or purchased them? I LOVE this but am not a crafty person at all and would need direction. Helpful advice please on how to do this? Where did you get these? In desperate need of corner shelves, but haven't found any liked but these ones. did you buy these at someplace like Bed, Bath & Beyond? Please tell!! Scroll up and read what she wrote in the blog. "First I started by begging my husband to build the shelves. Luckily, he likes doing things like this so it wasn't too hard." Here is a youtube video that shows the same style of shelves. She is awesome! My name is Anne Arntson and I'm the Editorial Production Assistant for HouseLogic.com. 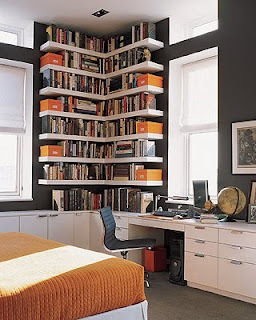 Here is another great shelving idea! Picture frame becomes storage AND a temporary counter top. Please take a look! Nice idea 💕. May i save the picture for my article?